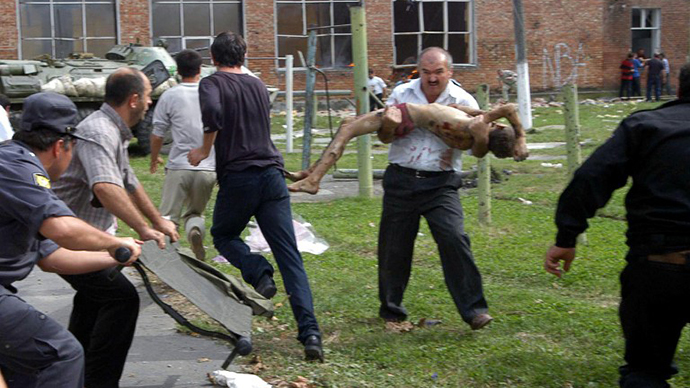 September 1 marks 10 years since one of the most horrifying terrorist attacks in Russia, the Beslan school siege which saw over 300 people, 186 of them children, killed. Events to commemorate the massacre are taking place across the country. The site of the tragedy, former school #1 in Beslan, a small town in Russia’s North Ossetia, will become the center of the remembrance ceremonies which have been annually held since 2005. In what has now become a tradition, the three-day events to commemorate those killed in the attack, will start at the schoolyard with a bell ring. Such bells ring in all Russian schools on September 1, symbolizing the beginning of a school year. For survivors of the Beslan massacre and relatives of the victims it is the bell toll that divided their lives 'before' and 'after'. Hundreds of people, including public activists and top officials, are expected to come to the site to pay their tributes to the hostages and those who lost their lives in the tragedy. They will lay more flowers and light candles at the walls of the ruined school building and a recently opened monument: a 50-meter long granite memorial with the names of all the victims carved on it. Toys and bottles with water will be brought in: the captives were held in the cramped, stuffy school gym and suffered from unbearable heat and thirst. On September 2, a requiem concert will be held on the stage of Beslan’s culture center. On Wednesday, at a ceremony in the schoolyard, students will release into the air 334 white balloons - the number of people who died in the hostage crisis. Later in the day, the commemorating ceremonies will move to the town’s cemetery – called The City of Angels – where hundreds of the victims were laid to rest. The bloodiest terrorist attack in Russia’s history claimed - in official figures – the lives of 186 children, 118 relatives or school guests, 17 teachers, 10 special forces officers, 2 Emergencies Ministry employees and one policeman. A further 810 people were injured. The Day of Knowledge, the beginning of a school year. A long-awaited event for first-graders: dressed nicely, with their brand-new school kits they rushed to Beslan’s school #1 for their First Bell ceremony. Many pupils were accompanied by relatives and younger siblings. A noisy crowd of people – including 859 students and 59 teachers - gathered in front of the school building for festivities. Shortly after 09:00 am local time 32 heavily-armed gunmen on two vehicles broke into the school and opened fire. Several civilians were killed in the shootout between the attackers and local police who ran to the scene after first gunshots were heard. The terrorists ordered the people to get inside the school building. Between 50 to 100 people – primarily high-graders and adults – managed to run away, but about 1,100 hostages were forced into the sports hall. The gunmen barricaded doors and windows in the gym and started mining the building with explosive devices. Russian media reported that there were two women wearing suicide-bomb belts among the attackers. At around 10am one hostage, an adult man Ruslan Betrozov, was reportedly shot dead in the gym, right in front of the children, after trying to talk to the terrorists and calm down the captives. By 11am the school territory was surrounded by police forces and residents of nearby buildings were evacuated. Senior public officials arrived at the site. Two authorities suggested exchanging themselves for captured children, but the terrorists turned down the proposal. President Vladimir Putin canceled his summer vacation in Sochi and returned to Moscow. The attackers, filming everything that was happening inside the school, announced they would only talk to the president of North Ossetia, president of the neighboring Republic of Ingushetia or Vladimir Rushailo, who was Russia’s Interior Minister in 1999-2001. The latter was however confused with Professor Leonid Roshal, a famous Russian pediatrician, by the hostage who was taking down the note. The terrorists demanded the withdrawal of armed forces from Chechnya (a Russian republic in the North Caucasus) and the release of a group of arrested gunmen. The hostage-takers threatened to blow up the school in case police attempted to storm the building. They put children in the windows using them as human shields and said they would kill 50 hostages for every killed member of their group and 20 – for every wounded one. At 3:50pm the Russian Air Force delivered the first groups of Special Forces troops. Between 4 and 4:30pm, a blast and shooting were reported in the seized school. Several hostages died and their bodies were thrown out of the windows shortly later. Dr. Roshal, though unwanted by the gunmen, still managed to establish contact with them at around 8pm. They insisted that the presidents of Ingushetia and North Ossetia, along with Putin’s advisor Aslambek Aslakhanov, must participate in the talks as well. By 9pm a large crowd of people – mainly the hostages’ relatives – had gathered outside the school building. The gunmen refused to accept medicine, water and food for the hostages. Negotiations between Roshal and the attackers continued late into the night, but brought no breakthrough. In the morning, the head of oil refining company RussNeft, Mikhail Gutseriev, offered terrorists money in exchange for hostages. They declined the proposal. As a result of negotiations, by 4pm the gunmen agreed to meet with former Ingush President Ruslan Aushev. After the talks, 26 hostages – women with babies – were released. The gunmen also handed a message to Aushev with their demands: the withdrawal of troops from Chechnya and full sovereignty to the republic. Meanwhile, Roshal continued negotiations with the attackers, asking them to allow food and water be passed to the captives, but the talks yielded no positive results. Several blasts rocked the school and shooting was reported during the night and early in the morning. Those released said that the number of hostages inside the building was over 1,000 instead of 354 as it had initially been thought. Shortly after the noon, the terrorists allowed Emergencies Ministry workers to approach school to retrieve the bodies of those killed that had been lying in front of the building for two days. At around 1pm, as rescuers got to the site, two powerful explosions ripped through the school gym followed by gunfire. It was not immediately clear what caused the blasts, but later reports suggested that the gunmen provoked them accidentally. According to one version, a suicide bomber blew herself up. According to another, explosive devices placed into hoops in the gym fell down. The blasts triggered chaos, with hostages trying to flee through a hole in the wall and terrorists opening fire on them. Security forces returned fire and helped a dozen captives run away, often sheltering them with their own bodies. The gunmen attempted to force the remaining hostages from the partly ruined sports hall to the canteen. At 1:10pm security forces started storming the building. Snipers opened fire on terrorists’ firing points while troops were evacuating the hostages. Federal Security Forces (FSB) officers broke into the gym: there were dozens of wounded and exhausted hostages there, but the terrorists had moved to the school canteen and were shooting from there. At about 2.20pm a blaze broke out in the sports hall. By the time fire brigades arrived at the scene, the majority of hostages from the gym had been evacuated. About a hundred special forces troops were inside the building. Five militants were reportedly killed. After 3pm evacuation from other parts of the school was still ongoing amid a continuing gunfight. Mobile medical units were deployed in the area to immediately help the wounded before taking them to hospitals in Beslan and Vladikavkaz. Between 6 and 7pm, after it was established that there were no more captives in the school building, troops used Shmel rocket infantry flamethrowers against the militants. Two T-72 tanks were also deployed in the nearby area. By 9:30pm the hostage-takers were proclaimed eliminated and shortly before midnight the school was under full control of security forces. Rescuers continued recovering the bodies of the victims from the school debris. Relatives who had not found their loved ones alive flocked to hospitals and examined the long lists of injured placed on the walls, hoping to find names among them. Those who lost hope had to look among the dead bodies. President Putin arrived in Beslan in the early hours on Saturday and visited one of hospitals. The official death toll rose as some of the badly injured died. Over 50 remained in critical condition. The first funerals took place. North Ossetian Interior Minister, Major General Kazbek Dzantiyev, announced his resignation. He said that “as an officer and a man” he had “no right” to occupy his post after what happened in Beslan. 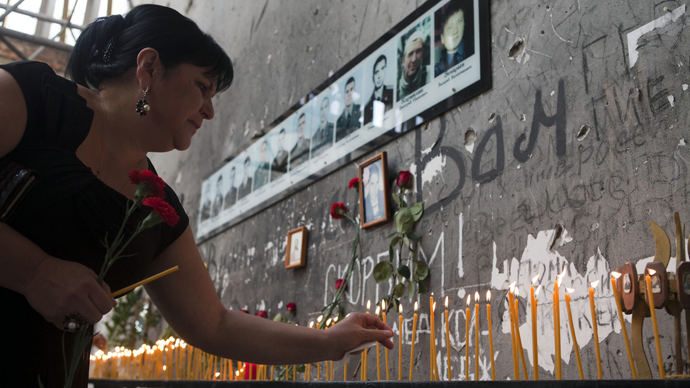 Mass funerals took place in Beslan. Two days of national mourning began in Russia. A decade on, the survivors of the tragedy still cannot forget those terrible days they spent on the verge of death. Those who lost their loved ones do not believe their psychological wounds will ever heal. They keep coming to site of the attack – which has since been turned into a memorial – and to the cemetery, the City of Angels, one of the rare graveyards in North Ossetia where both Christians and Muslims were laid to rest. “There are no Muslims and Christians here. They are children. They are innocent creature. And all people come [to the cemetery] – Christians and Muslims…They come in tears and go in tears,” Kaspolat Ramonov, the keeper at the City of Angels told RT. His family was taken hostage in 2004. The wife and son seriously injured and his eldest daughter was killed.